Here at Macworld, we believe that everyone should be able to use and enjoy their Macs and iOS devices, whether they’re a technology addict, recent Mac convert, or someone who’s never owned a computer. That’s why we created our Macworld Superguide series: Over the last seven years, we’ve released over 40 ebooks to help all users—beginner, expert, or in-between—with their Mac, iPhone, iPad, and other Apple-influenced technology. Available for all major platforms (iBooks, Kindle, Nook, Mac, and PC), our ebooks are hand-crafted by the Macworld staff and packed with practical how-tos, in-depth features, tips and tricks, and more. 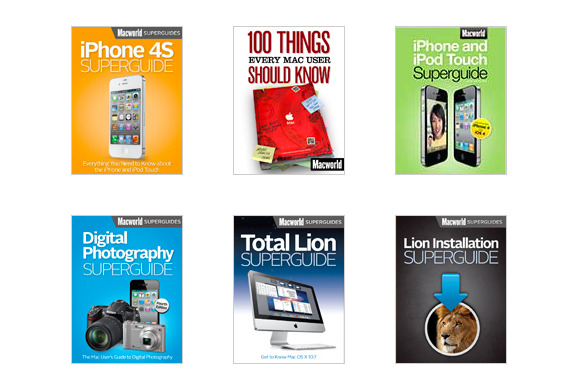 And in celebration of the holiday season—and the many Apple devices likely to wind up under trees worldwide—we’re happy to announce that all our popular Macworld Superguides are on sale through our eBookstore. Throughout the month of December, you can save 10 percent off your entire purchase by using the coupon code: MAC10. Our eBookstore carries our ebooks in both PDF form and as a multi-format bundle. Bundles include a copy of the ebook for iOS and Nook (ePub), Kindle (MOBI), and your Mac or PC (PDF), allowing you to read on whatever device you prefer, at any time. (And all our ebooks are—and will remain—DRM-free.) We have a quick tutorial on our website to help you get various ebook formats onto your devices. Whatever you find yourself gifting (and gifted) this holiday season, we bet there’s a Macworld Superguide out there for you. Our full list of Macworld Superguides is on our website; if you’re looking for somewhere to start, check out our most recent titles: We have books for iPhone and iPad lovers alike with the iPad Starter Guide, iPhone 5 Starter Guide, iOS 6 Upgrade Guide, and Master iPhone Photography. And if the Mac is more your style, check out our recent OS X guides: Mac Basics: Mountain Lion, Total Mountain Lion, and Mac Gems.